When studying boletes, it is important to learn how to examine their microscopic structures. Microscopic study is essential for the proper determination of many boletes, e. g. it is vital when dealing with xerocomoid boleti. 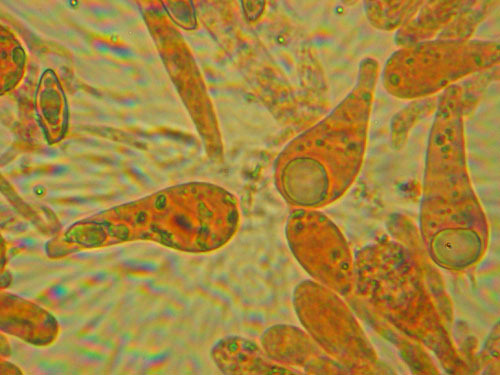 There are special manuals that deal with the microscopic examination of fungi (see the literature section of the site). However, I decided that some quick and simple explanations of how the things could be done might be useful. Do remember that this is a short introduction and the advanced reader may decide to read detailed explanations of the methodology. If so, I would recommend the book of Ladurner & Simonini (2003; see the literature section). 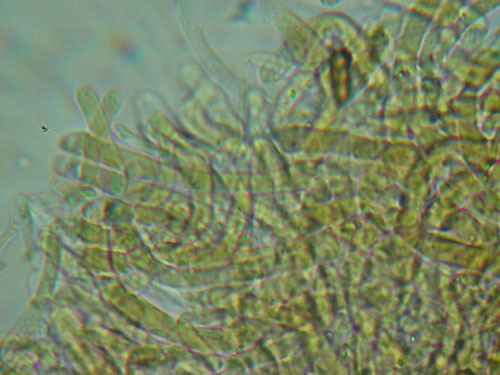 I would also suggest visiting the Fungi 4 Schools web-site, which provides access to a series of articles on microscopy and microphotography that appeared the journal Field Mycology. Microscopes, microscope cameras and other necessary equipment is available from our Equipment store. Microscope. Nowadays, there is a variety of microscopes and one may chose a model suitable for their needs. One should consider the magnification (magnification of X1000 will definitively suit most needs). Amateurs must also remember to make sure the microscope to have micrometer, so measurements of the microscopic structures could be taken. Many microscopes today might be fitted also with photographic equipment, so one could take photographs. Very often microscopes with photographic equipment will also come with software for measuring but some measurement software is also freely available or sold at reasonable price. Setting up the microscope before the actual work begins is an important step. However, I would avoid further explanations on this topic as these are available in most manuals on light microscopy. 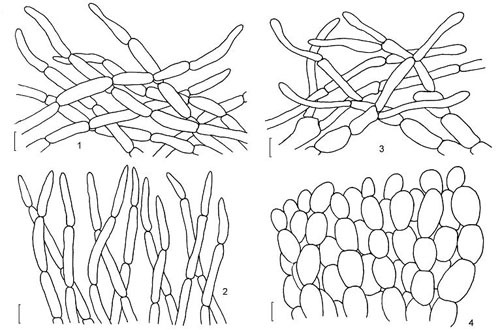 There are also two very useful papers that appeared in the journal Field Mycology. These are available online (paper 1, paper 2). Forceps. A wide variety of these are available for use. Forceps with fine needle-like tips will likely prove most useful. Razor blades. This invention, that whenever changed man’s life might be nowadays difficult to find in some countries, dismissed in favor of modern safety razors. Nonetheless, razor blades remain a necessity in the mycological practice. There is nothing else that could ensure making of very thin slices for microscopic preparations. Needle. Buy one or make one yourself. Slides and cover slips. The availability of these varies from one country to another, so consult the internet or a biologist, where you can find some. Various chemicals are extensively used in the microscopic examination of the boletes either as mounting media for preparations or for carrying colour tests. Their recipies may vary and are found in many mycological book. Willing to spare time and efforts of the beginners in microscopy, I hereby describe the recipes I use. Most of the solutions are sensitive to light and therefore keeping them in dark bottles is highly recommended. Note that dyes are often used also as mounting media, e. g. potassium hydroxide, ammonia, Melzer’s solution and Congo red solution are arbitrarily used as mounting media. Measurements might be taken in any mounting medium, but keep in mind to note what kind of medium was used. Personally I prefer when possible to measure the microscopic structures in tap water. For those who are willing to go deeper in those topics I would recommend Basso’s excellent handbook on microscopy (see the literature section). Do remember that all the chemicals listed below are dangerous and poisonous and all of them should be thoroughly labeled as poisons and kept away from children! Potassium hydroxyde. Extensively used as mounting medium in microscopy due to its properties. It revives well the dried fungal tissues and also clears the preparation. Indispensable when studying cuticle sections as it reveals the ornamentation of the hyphal walls. Potassium hydroxide is used as 10% or 5% solution. Take care as the solution is corrosive and may cause injuries if comes in contact with the human body. Ammonia solution. It has similar properties as potassium hydroxide. Personally I do tend to use it rarely due to its high volatility and unpleasant smell. Lactic acid and Lactophenol. I would not recommend using them for boletes. Both lactic acid and lactophenol are highly viscous fluids and bolete spores tend to turn to the “wrong” side when mounted in any of them. Moreover lactophenol is known to have carcinogenic properties. Cotton blue (also known as Methyl Blue or Aniline Blue). Rarely used. In preparations after heating it tends to stain the walls of the fungal cells and reveal the spore ornamentation. It could be of some use for examination of the spores of xerocomoid boletes, especially if a good light microscope is available. Congo red. Used very often to make the transparent microscopic structures more easily visible. Prepared as ammonia solution adding the dye to ammonia. The resulting solution is unstable due to the volatile properties and the dye that tends to precipitate. The most convenient way is to prepare it on the moment, getting almost invisible amount of the powder on the top of a needle and adding it to a drop of ammonia placed on the slide. Basidia stained with Congo red. Melzer’s solution. Iodine solution that is indispensable for any boletologist. 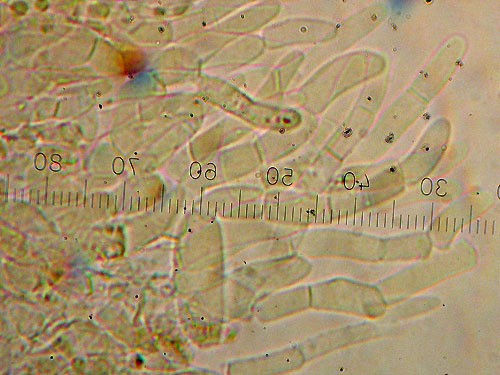 Used to test the amyloidity of the hyphae of the base of the stipe of the boletes. The solution is highly toxic due to the presence of both iodine and chloral hydrate, so one should take extra care when keeping and using this reagent. Chloral hydrate may be difficult to obtain as it is carcinogenic and its selling is restricted in many countries. See this paper for some tips how to get it. Note that Lugol’s solution/IKI is used in the study of some other fungi but it has not been proven that it causes the same amyloid reactions in the boletes as caused by Melzer’s solution. Ingredients: chloral hydrate 22 g, iodine 0.5 g, potassium iodide 1.5 g, distilled water 20 ml. Preparation: dissolve the potassium iodide in water, then add the iodine and let it to dissolve for 24 hours; add chloral hydrate and stir well until dissolved. Keep in dark bottle – the resulting solution is light sensitive. Generally, microscopic slide is prepared by putting a small drop of the mounting medium and adding the fungal material. The cover slip is gently held by two fingers in the two corners. Touch the edge of the drop of the mounting media with the free side of the cover slip and then very slowly lower the cover slip until the preparation is covered. The excess of mounting fluid may be removed by blotting paper or a piece of paper handkerchief. Personally, I prefer working with dried fungal specimens, thus ensuring uniform conditions for measuring. Preparing a slide for observation of spores. There are various ways of preparing a slide for examination of spores. One of the easiest ways is from spore print if there is one available. In this case with needle take a small amount of spores and add to the mounting fluid. If there is no spore print, examine carefully the collection you want to study. Very often in the upper portion of the stipe there is some amount of spore powder which you can use similarly as spore print. If none of these is available, take a small piece of the hymenophore (tubes or gills), soak it with water and leave it for 20–30 seconds on the slide. Remove it with forceps, squeezing gently as to leave some of the water with spores on the slide. Finally cover the preparation with a cover slip. Preparing a slide for observation of basidia and cystidia. With a razor blade prepare a very thin section of the hymenophore and mount it in the preparation. Squash the preparation gently with the rubber tip of a pencil, taking care not to break the cover slip. It will take some time to learn how to cut very thin sections. Preparing a slide for observation of the cap cuticle. With a razor blade prepare a very thin transparent section of the cuticle and mount it in the preparation. Squash the preparation gently with the rubber tip of a pencil, taking care not to break the cover slip. As for the hymenophore learning how to cut thin sections of the cuticle will also take some time. Testing the amyloid reaction. The amyloid reaction is characteristic reaction of the flesh of boleti with iodine containing solution. It is accepted that boletes are tested with Melzer’s solution. There are four possible results of this very important test – inamyloid, amyloid, dextrinoid and the so called “fleeting amyloid”. Hyphae are amyloid when Melzer’s solution causes characteristic blue or blue-violet coloration of their content. Dextrinoid is called a reaction when tissues are stained reddish-brown. Inamyloid is the case when no colour change occurs. The fleeting amyloid reaction is blue to blue violet. The difference from the amyloid reaction is that in the later hyphal content is more or less permanent (though bleaching with time). The fleeting amyloid reaction is for a short time (usually few seconds) localized in the fungal tissue and then the blue-coloured content leaves the tissue, causes bluish colouring in the surrounding Melzer’s solution and finally quickly disappears. This is explained by blue coloration of easily soluble substances that leave the fungal tissues. Testing of the amyloidity is done by mounting pieces of different parts of the fruitbody (flesh of the cap and from the stipe base, hymenophore) in Melzer’s solution. The existence of fleeting amyloid reaction is tested by simply submerging of fungal tissue in Melzer’s reagent and covering the preparation by cover slip. Observation in this case is made by naked eye. The testing for the other three possible cases is a bit more laborious. 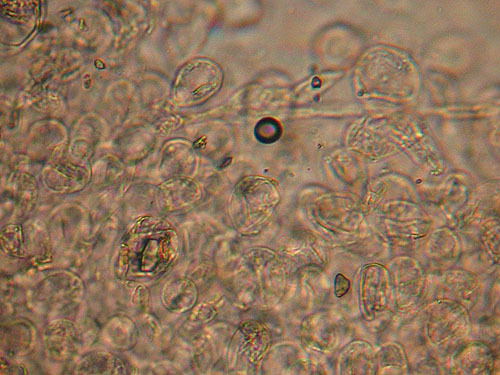 Pieces of fungal tissue are thoroughly and carefully soaked in Melzer’s solution and left for about 30 seconds. Afterwards pieces are removed with needle or forceps and gently “washed” in pure chloral hydrate to remove the excess of Melzer’s (yellowish coloured). Finally the sections are mounted in pure chloral hydrate and observed under microscope. The reaction is often given as I+/I- or J+/J-. Do remember that when talking about amyloid reaction in the boletes the information “hyphae amyloid” means the hyphae of the flesh in the stipe base, unless otherwise stated. Note also that test should be carried always on dried specimens as to ensure uniform results. Basidia maximal lenght and width. 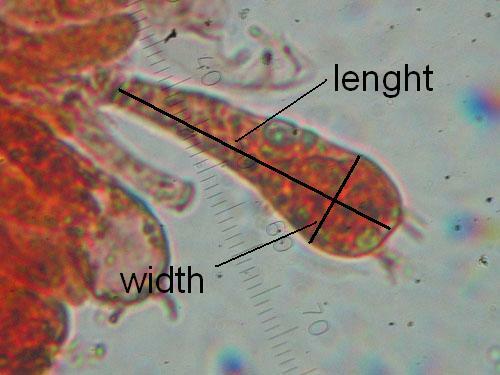 Measure at least 15 basidia for each collection, choosing only basidia with developed sterigmas (the four appendages seen on the top of a basidium). See the picture below. 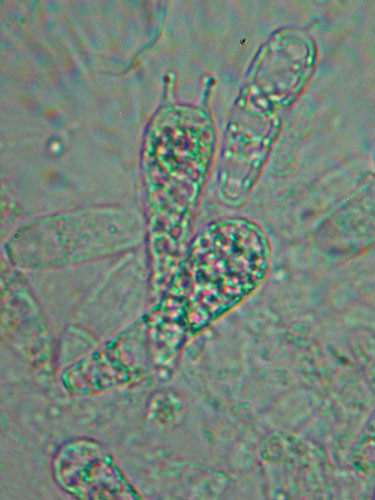 Cystidia maximal lenght and width. Measure at least 15 cystidia for each collection. See the picture below. 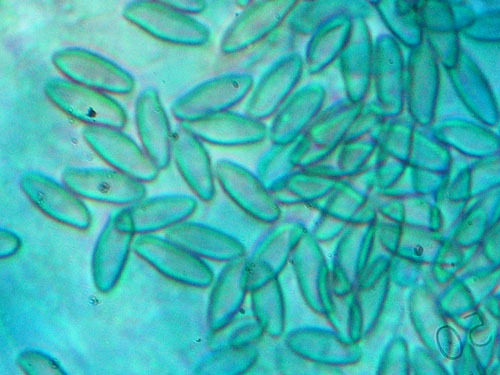 Basidiospores lenght and width. Measuring basidiospores is the most tricky part. Take care to measure only normally developed, fully matured spores. These are recognized as having darker content and better developed guttules. 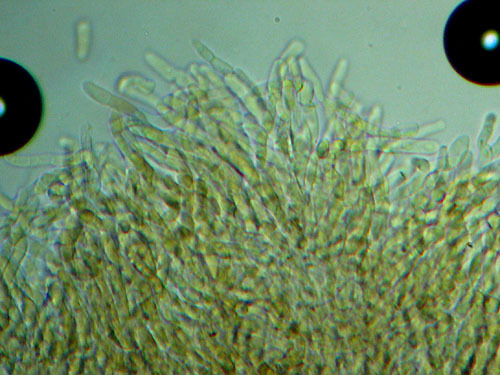 Not well developed spores look paler and have more uniform content (see the pictures below). 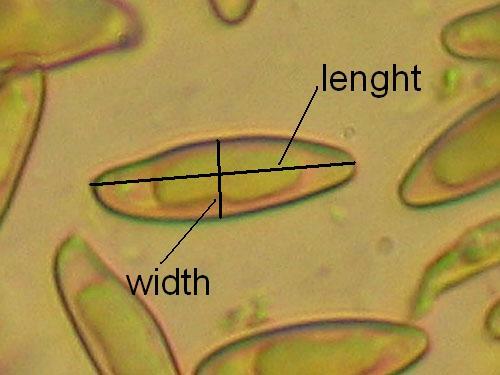 Remember to measure only spores in side view as illustrated below. 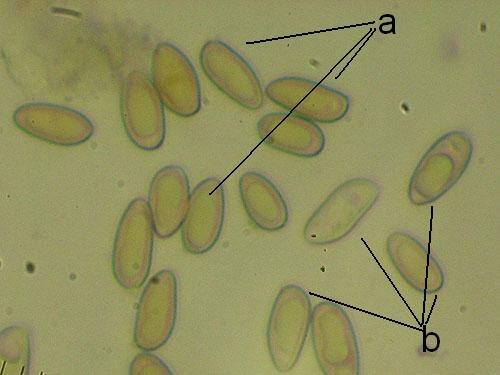 Measure randomly at least 30 (preferably 50) spores for each collection studied. Write the values down and calculate the spore quotient dividing the spore lenght by the spore width. 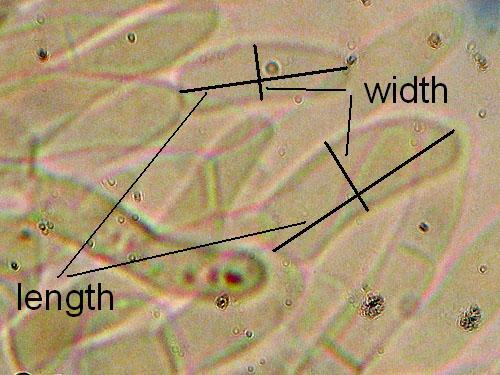 Lenght and width of the end cells of hyphae of the cuticle. Generally, in boletes hyphae of the cuticle might be arranged in two ways forming what is called trichoderm. In many boletes hyphae are irregularly interwoven and this type of cuticle will be called irregular trichoderm. In others hyphae are erect and almost parallel to each other and this type of arrangement is called palisadoderm. 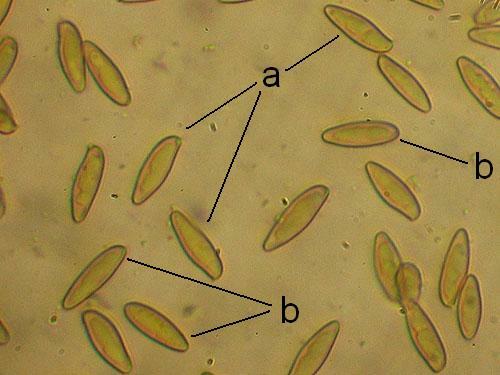 A special type of trichodermium is seen in most species of Suillus and some other genera, where irregularly scattered and interwoven hyphae are embedded in amorphous gelatinous matrix, barely seen as almost transparent substance in preparation. This type of cuticle is known as ixotrichodermium. Cuticle preparations does not look very much to the sketch above, so one should learn to "read" them. 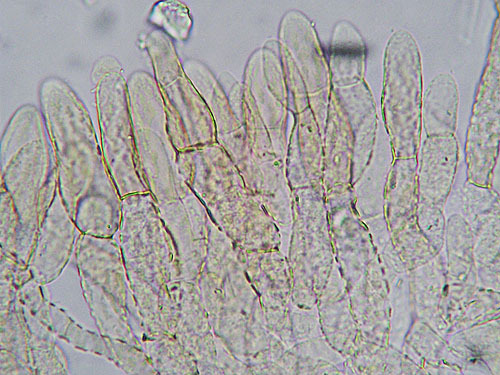 This one is trichoderm of interwoven hyphae. Another cuticle preparation of trichodermium. Detail of the cap cuticle of Boletus depilatus under light microscope. Note the rounded and not incrusted cells. Detail of the cap cuticle of Xerocomus rubellus - a palisadoderm of heavily incrusted hyphae. After you have carried out the examination and made a sketch of the cap cuticle, measure the lenght and the width of at least 30 hyphal end cells. For each end cell calculate the ratio, dividing the lenght by the width. Carefull squashing of the preparation with the rubber tip of a pencil helps to separate the hyphae and obtain better view. Measuring end cells of cuticle hyphae. After all microscopic measurements are taken, these are most often processed by the means of statistics, calculating mean value, standard deviation and other statistical parameters. There is a lot of reading in the internet on how to use statistics, so I would not be stopping on this topic here. 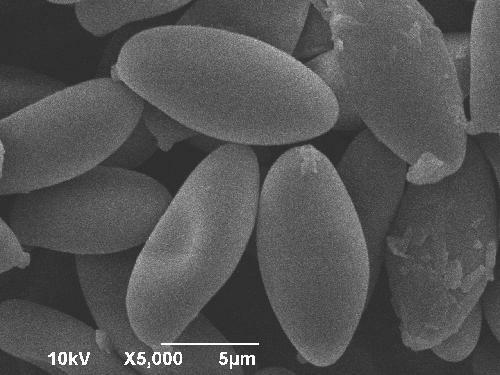 Although a bit costly, the scanning electron microscopy is the best way of observing the spores of the xerocomoid boleti, as it reveals their fine ornamentation, that is often not seen under light microscope. There are easy ways to preprare a specimen for SEM observation. Preparations for SEM are mounted on special metal stubs called holders. To prepare a spore sample take a small piece (approx. 5 × 5 mm) of double adhesive tape and mount it on the holder. Then take small pieces of the hymenium of the bolete (pores or tubes) and stick them gently but firmly onto the adhesive tape. 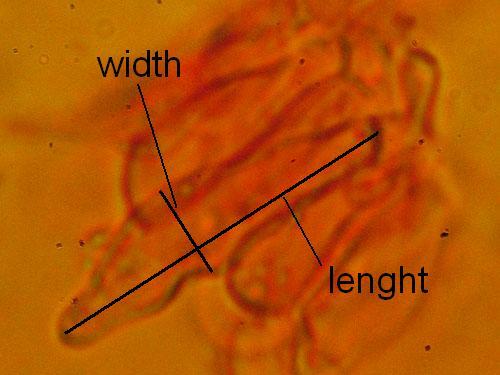 A piece of hymenophore of approximate size 3 × 3 mm will usually contain ample amount of spores. After this the specimen is further processed in the SEM-lab where it is sputter-coated with very fine gold cover. After that it is ready for observation. 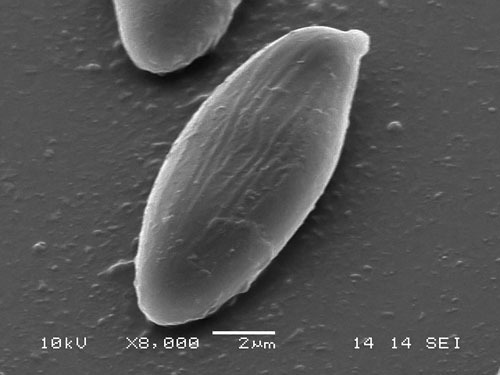 Below are some SEM-photographs of ornamentation of bolete spores.